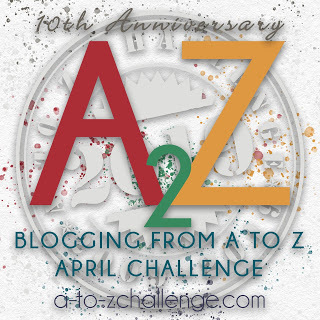 During the month of April, I participated in the A to Z blogging challenge. A first for me, I attempted fiction for the first time. I had such fun with it that I decided to give it another go. This time I will be writing a serial type of story. As I meander through my imagination, I expect an episode to take shape in time to be posted each Tuesday. Rachel had the phone propped up to her ear, trying to hold it steady with a hunched shoulder as she walked around the apartment. She turned the burner knobs on the stove to make sure all four were off. Rachel walked into the bedroom to assure herself that she had indeed unplugged the iron. She had the feeling that she was forgetting something, though. Everything was fine once. She missed him. She tried to practice the “Sam Method" of dealing with stress. “What’s the worst that can happen?” he would ask. She let out a rueful little laugh. She could think of a lot of worst things right now. Her phone rang, startling her out of her reverie. The caller ID displayed the number of the car service. “I’m down here in the parking lot. If you’re ready, I’ll come up to get your bags,” he said. She unlocked the door, opened it and stepped into the hallway. The driver lumbered up the steps. He was short and stocky with graying hair. Rachel motioned towards her suitcase and duffle. As he headed out the door with her bags she told him that she would be down in a minute. She took a final look around. She heaved a heavy sigh and shook her head. “I hope I’m doing the right thing,” she said quietly. She walked out, locked her door and headed down the steps to the awaiting car. Rich held the door open for her. “All set?” he asked, once he saw that she was seated and buckled in. “Ready as I’ll ever be,” Rachel answered, letting out another sigh. Soon they were coasting along the highway. “Your plane leaves at noon, right?” Rich asked. “We’ll be there in plenty of time,” the driver promised. She tapped in her sister’s number. After the fourth ring, Rachel was about to hang up when Evie answered. Before Rachel could say a word, Evie said, "Look, Rachel, you don't have to remind me again. I said I would look in on Mom every day, didn't I?" "I know you will," Rachel said. "How many times have you been through this Rachel?” Evie asked in a challenging tone. Evie and Rachel were born 13 months apart, with Evie being the older of the two. When they were younger, even though neither one of them thought they looked like the other, they were often mistaken for twins. They both had fair skin, hazel eyes, and light brown hair. Evie was the one with the freckles. They were each other’s best friend, one or the other taking on the role of protector when the occasion warranted. Rachel knew that Evie was concerned about her, but she did not want to have that conversation again with her sister. She reached into her tote and wrapped her fingers around the knitted fabric, bunching the sleeve into a ball in the palm of her hand. She was sure the red sweater in her bag would lead her to find answers to the questions she agonized over. As they pulled into the passenger drop off area, Rachel felt the tears start to well up. She squeezed her eyes tight, trying hard to hold them in. Sitting at the gate, waiting to board the plane, she tried to remember the last time she traveled on her own. She glanced around at the other passengers. She was sure she was not the only one who was a single. In fact, she noticed several people reading or engrossed in one device or another, seemingly alone. But, she was drawn to the couple across from her. She tried not to stare. One time the woman caught her looking and Rachel quickly looked down at her magazine. She smiled to herself and wondered if they were as happy as she and Sam, forgetting her reality for a brief moment. She had reservations at the Charrington Inn. Charrington is a small town on the eastern shore. Rachel and Sam discovered the Inn once on a weekend jaunt. She chose the White Pine room, of course. She recalled sunset memories on the balcony overlooking the meadow. The innkeepers, Roz and Michael, welcomed her warmly. Roz was a full figured woman with short curly brown hair. She had a wide generous mouth and a ready smile. Her matronly figure gave her the appearance of an older woman, when, in fact, she was barely out of her thirties. Michael, on the other hand, was tall, thin and wiry. He had thick dark wavy hair and piercing blue eyes. “Rachel, I’m so sorry,” said Roz mournfully. Rachel caught Michael giving his wife a warning look. Up in her room, she called to check in on her mother. Mary, her mother’s caregiver, answered the phone. Rachel spent a few moments comforting her mother. "I promise I'll not be away for long," Rachel said. "Bye, Mom", Rachel said and clicked the phone off. She decided to take a long luxurious bath before dinner. She opened her tote and reached in to take out the sweater. Evie heard the squeak of the bathroom door and then a thud as it closed. Those were the two sounds that woke her each morning. She and Ed have been together for a dozen years. It was a second marriage for both. As she found out early on, he was a creature of habit. He had his own internal alarm clock, waking up every day at 7:15. Ed was of average height and build. He had a nondescript look, with brown hair and eyes. He was the sort of man who could easily blend in with a crowd without anyone paying much notice of him. She yawned and stretched. She thought about rolling over and going back to sleep, but then she remembered her commitment. She propped herself up on her elbow and fumbled around for her glasses. She picked up her phone to check the time. How strange, she thought. It was only 6:15. More proof that Ed hasn’t been himself lately. Something was bothering him. Whenever she asked him about it, he dismissed it, saying he was feeling a little tired. “That’s all it is, really,” he would say. The door squeaked again as Ed came out of the bathroom. Evie watched husband rustling around in his dresser. “Ed, why are you up so early?” she asked. He came over to her and gave her a kiss. They used to joke about how he always brushed his teeth before the first morning kiss. She called it his CMF kiss. “Your breath is so Crest Minty Fresh”, she would tease. She noticed he hadn’t brushed today. “I have to go into work a little early,” he said. Rachel and Ed were partners. They were co-owners of Old & Yew, an antique and yarn shop housed in a long, low cinder block building down by the docks. Fifteen years ago Ed lost his first wife, Kathy. Kathy and Ed were the original owners of Old & Yew. Rachel, an avid knitter and lover of precious bygone era treasures, was not only a steady customer but soon became close friends with both Ed and Kathy. “I felt a warmth of comfort from the first moment I walked into the shop,” Rachel repeatedly told Evie. She remembered how animated Rachel became whenever she talked about the shop. "An old fashioned cowbell on the door announces the comings and goings of customers. The large space is divided in half with beautiful antiques and unusual vintage items on the right-hand side. There are dark walnut breakfronts displaying beautiful old china and crystal. The drawers of a maple dresser are filled with crisp white linens. Some are hand embroidered with simple cross stitch designs,” Rachel would say as if in awe. "Ed, he's one of the owners, he sits behind an antique case filled with estate jewelry. He has stories about each of the diamond rings, ruby pendants and emerald bracelets he was lucky enough to acquire from Aunt Sadie or Grandma Rose’s collection,” Rachel would breathlessly relate. Rachel would be especially tender when talking about the other side of the room. “That side is Kathy’s creation. She sectioned off an area by placing old large wooden rockers in a circle. Rough pine cabinets surround the cozy ring of old chairs. The cubbies are filled with scrumptious fibers wound into rainbow balls. Loose hanks of shimmering gossamer webs hang from low ceiling rafters,” Rachel would continue. “A showcase of lovely scarves, hats, sweaters and shawls proudly made by Kathy’s students are tucked here and there among the displays of yarns, needles and hooks. Knitters and crocheters rock and chat away many a Tuesday and Thursday afternoon nestled in Kathy’s cocoon of peaceful,” Rachel would emotionally say. After Kathy passed away, Ed thought about closing up the shop. “It’s too much for me,” he told Rachel one afternoon when she stopped in to see how he was doing. “There are too many memories here,” he added. Rachel convinced him to take some time before making a decision. She began stopping in daily to check on Ed. It isn’t clear who had the idea first. It sort of happened naturally that she and Ed became partners. The day Rachel took over Kathy’s side, Evie knew that Rachel would honor Kathy’s memory by keeping everything the same. “It had been a life long dream of Kathy’s,” Rachel said. Rachel soon asked Evie to come in a couple of times a week to lend a hand. That’s how Evie and Ed met each other. “Have you heard from her?” Ed asked, still frantically opening and closing drawers. “Who is this old friend she is going to meet?” Ed asked. "Someone she went to school with," Evie answered evasively. She didn’t like lying to Ed. But she promised Rachel she wouldn’t tell anyone where she really was going or why. “Do you think you’ll be home in time for dinner?” Evie asked, trying to change the subject. Ed was now in the walk in closet. Evie could hear clanging of hangers being pushed along the rack. Just then the phone rang. It was Rachel. “Eve,” Rachel said and then hesitated. “What is it?” asked Evie. “How are you?” Evie asked, in an urgent whisper. "Something bizarre happened here yesterday," Rachel said. "I knew this was the right place to start." Evie hung up the phone just as Ed walked out of the closet. “Who was that?” he asked. “Just a wrong number.” She answered. “I can’t seem to find it,” he exclaimed. Rachel sat at the white painted desk with her chin cupped in her hands. The desk fit cozily in the windowed alcove of her Inn room. It was barely sunrise. She was exhausted. As she gazed out the window, she saw Michael, the innkeeper, leading the horses out of the barn into the field. Rachel was having second thoughts about this visit to the Charrington, especially after her restless night. She was particularly questioning her judgment to stay in the White Pine room. She had tossed and turned, unable to find solace in the oversized bed. Fond reminisces of happy times she shared with Sam turned into taunting nightmarish dreams. She woke several times during the night feeling fitful and uneasy. Rachel, who struggled with anxiety, had panicked the night before when she thought she had lost the sweater. It was barely a swatch. The sleeves were pilled from years of stroking. The heart-shaped buttons dangled, barely hanging on by a single thread. Like her life, she ruefully thought. She still could not figure out how the sweater wound up on the floor next to the bed. It must have fallen out of the tote when she tossed the bag on the bed, she reasoned. She laughed when she spotted it. That’s what I get for being so careless, she thought. Sam would have been the one to neatly place the luggage on the bedside rack. Remembering the scare she had last night, thinking that she might have lost the most precious link she had, her stomach clenched. She could feel a warm flush creep up from her neck and into her cheeks. The palms of her hands began to sweat and her heart pounded in her chest. Only she understood why a shabby faded piece of cloth meant everything to her. It was like the fuzzy pink “blankie” she carried around with her when she was a child. Pull yourself together, woman! You have to follow through with your plan, she admonished. Sam was the easy going one. His mild, serene composure provided the stability her chaos required. The shock of the past two months, not having Sam with her, had jolted her into realizing how much she loved him. Rachel looked at her watch. She had to talk to Evie, but it was too early to call her. She could smell the aroma of freshly brewed coffee wafting up from the kitchen and decided to go down to grab a cup. The pot was set up in the dining room along with fresh warm croissants. As she was pouring her coffee, Roz came into the room. “I think I understand,” Roz said kindly. “I’ll help, if I can,” said Roz. Rachel reached into her jean’s pocket and pulled out a scrap of folded paper. She opened it flat and read off a name. Rachel caught a look of recognition on Roz’s face. “Oh,” said Rachel. “Well, I have an address, here. Are you familiar with this area?” Rachel asked, pointing to the address on the paper. Roz said, “I’ve got to get breakfast ready, my dear. Will you be joining the other guests this morning?” Seemingly avoiding Rachel’s question and not waiting for her answer, Roz went scurrying off to the kitchen. Rachel left the dining room with her coffee and went out to the wide front porch. The sun was up by then and there was a slight breeze. She sat in one of the red slatted rockers and tapped in Evie’s phone number. After a brief conversation, Evie promised to call Rachel later on. While she waited for Evie, she contemplated the path she had been on and what led her back to Charrington. And as she had done every day since the day she finished knitting “ Elizabeth Zimmerman’s Baby Surprise Jacket” in persimmon red, she felt a deep longing and unbearable sadness. When is Mary going to come help me out of bed? Adele impatiently thought as she looked at her watch for the fourth time. This was the day that the doctor was going to take the cast off of Adele’s ankle. A youthful looking, active woman, Adele would be turning 75 in a few months. She walked 2 miles every day, rain or shine. She gave up dying her hair years ago and usually wore her shoulder length pure white hair tied back in a girlish ponytail. She and Jane, her best friend, and next-door neighbor, were on one of their walks on the “path” the day that she had the accident. The “path” as it was commonly known by the locals, was a groomed 8-mile nature trail maintained by the town. It meandered along the old abandoned railroad tracks. She clearly recalled the details of that day. They had been walking at a steady pace, chatting away when Jane let out a scream. Startled, Adele literally jumped backward. The next thing Adele knew, she was on the ground, her foot twisted underneath her body. The reason for the scream was a fallen tree branch that Jane mistook for a snake. Another indication that Jane’s eyesight was beginning to fail. As Jane tried to help her up, Adele gasped with pain when she attempted to put her foot down. With Adele’s arm flung over Jane’s shoulder and Jane’s arm wrapped tightly around Adele’s waist, the two women managed to get back to the car, Adele hobbling on one foot the whole way. Adele had been laid up with her injury for the past six weeks. This was the first time she could remember having to be still for such a long period of time. “Addie, don’t let the grass grow under those feet,” Bob used to tease her. Even when everyone, including herself, had the flu that time, Adele managed to take care of Bob and the girls, sneaking in a few minutes of rest when she could. Now, comforted by the warmth of the sunroom, she spent hours sitting, staring out at the clouds and reflecting back on her life. The accident had made Adele realize that she was vulnerable and that she was not invincible. She was anxious for Rachel to get back. Adele knew the time was right to tell her youngest daughter the truth. She was afraid. She wondered if Rachel would understand why Adele had lied to her. She worried that her daughter might never be able to forgive her. Bob hadn’t agreed with the decision. He and Adele had argued many times over it. Adele was strong willed and usually got her way, especially with Bob and eventually he gave in. The only way Adele would agree to the “arrangement” was with the stipulation that she and Bob had to be informed of the details, all of them. Spending most days of the past weeks in this room awakened memories of that time. Adele reminisced about cool spring days of so many years ago. Rachel would sit in this very sunroom after school doing homework. Some afternoons Rachel would sit propped up against the sofa at Adele’s feet, her head resting in her mother’s lap. As she wound a loose tendril of Rachel’s silky hair around her finger Adele was reminded of tiny baby fists. Rachel, barely into her teens, taught herself to knit. Adele recalled the day she and Rachel were browsing in the yarn shop. Rachel selected two skeins of soft, squishy “Persimmon Red”. “That’s an unusual color, choice sweetie,” Adele said to her daughter. She tried to entice her with pastels like “Petal Yellow” or “Minty Green”. Adele affectionately recalled the determined look of concentration on Rachel’s face. Her brow furrowed, her lips barely moving as she counted under her breath, knit two, purl two, knit two, purl two. Soon the sweater began to take shape. Adele’s phone rang. Rachel’s number displayed on the screen. "Mom?" Rachel's voice sounded strange. "Why didn't you tell me? You knew. All of these years and you knew. Evie sat on the stool behind the counter, staring into space. She was having a hard time concentrating on the inventory report and there were four boxes of yarn to unpack in the stock room. Ed had gone out. He told Evie that he was going to take a walk down to Uncle Pete’s deli. “What would you like for lunch, Eve?” he asked before he left. He was wearing his red sweater. It was one of Rachel’s creations. He had been in a panic earlier that morning when he thought it was missing. He finally found it hanging on the back of his chair in the study. Hand knit sweaters, in any shade of red, designed by Rachel was her way of showing affection and appreciation for those she cared most about. “For my heart’s love” she would say. Rachel tried to entice Evie to learn to knit. She was a patient teacher. “I’ll cast on for you,” she would say. “And I’ll even start a few rows,” Rachel said, trying her best to convince her sister. Then she would hand the ball of yarn and a pair of wooden needles over to Evie. Rachel made it look so easy. But when Evie did she felt like she was all thumbs. Evie remembered when Rachel first took up knitting. It was in the late 70s. Evie was sixteen, Rachel fifteen. Rachel was trying to think of a unique gift for Sam’s mother, Marge. Well, it wasn’t actually for Marge, but for the baby Marge was carrying. “You don’t even know how to knit, Rach,” Evie said. Rachel and Sam were teenagers in love. Marge was like a second mother to Rachel. She could talk to Marge about anything. Not something she could do always with her own mother. Then one day, Marge, Sam and Sam’s father suddenly left town. She did not want Rachel to be sad. Evie did her best to console her younger sister. But all Rachel wanted to do was work on the little red sweater. It was to be the first of many she would eventually make to give away as gifts. And then, years later, fate stepped in. “Let’s sit out front,” said Ed. They sat in the white slat rockers, quietly eating their sandwiches, each distracted by their own thoughts. Her phone rang. It was her mother. Rachel brushed past Roz on the stairs mumbling, “Sorry.” She fumbled in her purse for the key to her room. Her hands were shaking as she struggled to get the key into the lock. Once inside the room, she closed the door and leaned up against it. It was now dusk. The window shades were drawn, darkening the room, but she did not turn on a light. Her legs felt rubbery. She slowly sat down on the edge of the bed. With a rigid arm on either side of her body and her palms pressed into the mattress, she tried to steady herself. She slowly shook her head back and forth and began to cry. She turned and crawled on all fours up to the head of the bed. She sank down onto a pillow, pulled her knees up and hugged them tightly into her chest. She tried to make sense of it all. She had many questions and most of them began with “why”. Earlier in the day, mid-morning, right after breakfast, Rachel got into her rental car, typed an address into the car's navigation system and started on her journey. She wasn't sure what to expect, but she felt she had no other choice. The weight of uncertainty was suffocating. Her episodes of panic and anxiety were becoming more frequent and intense. Evie told her she was becoming obsessed with the whole thing. She hated when Evie talked about moving on. What would she know about it? That’s not fair, Rachel thought. Evie has been through difficult periods. She knew her sister was only trying to help. According to the GPS, she would arrive at her destination in less than two hours. During the first part of the trip, she traveled on rural single lane roads. Under different circumstances, she would have been able to appreciate sightings of longneck herons as they skillfully tip toed their way through scenic grassy marshes. This morning, though, her thoughts were narrowly focused. Rachel vividly remembered the day she found the document. It was a Sunday afternoon. Her mother called to ask if she would help her clean out Rachel’s father’s study. It had been two years since he passed away. Actually the day her mother called was the two-year anniversary of her father’s death. With the exception of an occasional dusting, the room had remained exactly as it was when Rachel’s father was alive. It had been his refuge. “It’s time, Rachel,” her mother said. “Evie and Ed are out of town. It will be just the two of us, I’m afraid,” she added. The room was small, but her father had made efficient use of the space. There were ceiling to floor bookshelves along opposite walls. Two club chairs were placed in front of a double window that looked out onto the street in front of the house. Her father started out each day sitting in one of the club chairs sipping on his coffee. He liked looking out the window, watching the early morning walkers and joggers passing by. His desk and computer were situated along the other wall facing the center of the room. The two women spent the afternoon sorting through papers they found in her father’s desk. “What are you going to do with the desk?” asked Rachel. It was an old worn oak piece. "I was going to give it to the second-hand shop. You know, the one affiliated with the church." "I know," Rachel said. But, it was Dad's. And look, here's where Evie and I carved our initials, she said pointing to the side of the desk." When her mother tried to open the center drawer, it stuck. “It seems to be locked,” she said. “Here let me try,” said Rachel. Rachel tugged, but it wouldn’t budge. She pushed it in and then pulled on it again and it gave way. That's when she found it. An envelope yellowed with age. "Emma's Birth Certificate" was handwritten on the front of the envelope. She recognized her father's distinctive script. Confused, Rachel’s eyes narrowed, her brow knitted. “Who is Emma?” she asked. Addie would never forget that day. Even after all of these years, when she thought about it, her stomach clenched and her jaw tightened. She vividly recalled how the sticky hotness of the day felt. Sometimes, the smell of a freshly mown lawn would remind her of that long ago August afternoon, causing bitterness and anger to rise from deep down until it bubbled up into her throat. She could almost taste the bile. The day that Rachel found Emma’s birth certificate was one of the strongest memory jolts she had ever felt. The memory was of the day Bob told Addie about the affair. He had called her in the middle of the day. He sounded agitated and was clearly upset. “What’s wrong?” asked Addie, feeling sick to her stomach. But Addie knew what Bob was going to tell her. She had known for months. When Bob got home, he went into their bedroom and threw himself onto the bed. He put his arm up to his forehead and his body began to shake from sobs he obviously could not control. Even though she knew about his affair with Marge, Addie wanted the satisfaction of watching Bob struggle with a confession he was now forced to give. Addie's mind was whirling. She had questions, so many questions. But at that moment she only wanted the answer to one. "Is it over?" she asked. "She's pregnant," Bob choked out in a hoarse whisper. When Addie began to have suspicions of the affair, she was almost cavalier about it. She realized afterward, after many months of therapy, that her aloof attitude was her way of protecting her own feelings. But she never expected this. She was shocked and horrified. "She's pregnant?" Addie asked, now feeling confused. "She's sure the baby is mine," said Bob. "Don, well Don," he stammered. "What?!" Adele shouted. "What about Don?" "He had a...well, he can no longer father children." said Bob. Several weeks after Bob had admitted to the affair, Addie confided in Jane. “You know that old saying that the wife is the last to know?” Addie asked Jane. “It’s not at all true. Wives are the first to know. "Bob treated me differently, you know," said Addie. "It was as though he was annoyed at me all of the time. I couldn't do anything right." That saying should be changed to, “Wives are the last to admit it to themselves,” said Addie. Now the memories of that day were coming back once again to haunt Addie. She had snatched the envelope with the birth certificate out of Rachel's hand. "Oh, I've been looking all over for that." said Addie. "Whose is it?" Rachel wanted to know. "Who is Emma?" Addie knew that she would eventually have to face this day. She and Bob had talked about it many times. They were supposed to tell the girls together. Why had they put it off, she lamented. She managed to stall Rachel by saying that she wasn't feeling well. "Listen, honey, this has been a long emotional day for me." Addie picked up the red sweater from the back of her chair and wrapped it around her shoulders. It was her favorite one of the many that Rachel had knitted for her. "Do you mind if we call it quits for now?" Adele was relieved when Rachel agreed. "I'll call you later, Mom, to see how you're doing." Where is rest of the story? Who is Emma???? To bad you never finished this story. It is interesting. Did she ever tell who Emma is? If you decide to finish this, I'd love to know! And my advice to you....KEEP ON WRITING! If this is your first attempt, you are well on your way - and I think there are a number of us who would look forward to your books! Please! Let us know what happens now...I sort of feel like the characters in this story were left hanging....and I, for one, really want to know what is happening from now on. Thank you for a good story...please bring us back down, okay? Oh wow! Thank you for your kind words about my story. You have inspired me to re-visit these characters. I am of the baby boomer generation. I have been married to my wonderful husband Ross for over 11 years. I have three children. My daughter Jen is married to Derek and they have two children. Bella is going to be seven years old soon and Ryan just turned three. My son Joe is married to Anne. They have a new baby boy, Domani Joseph. My heart aches as I include that my son Joseph passed away on Dec. 5, 2011. He was 36 years old. He died of Colon Cancer My youngest is my son Jimmy. He is the father of two sons. Kenny is five and Tyler is three. Ross and I live about 15 minutes from Barnegat bay and 30 minutes from the Ocean - Long Beach Island. We are both retired. We live a hour away from each of the children.